Instruments are used around the world by ophthalmologists and optometrists to scan patients’ eyes for signs of disease and to assist in the management of patients found to have disease. Early recognition of disease helps to delay and prevent the most common causes of blindness. 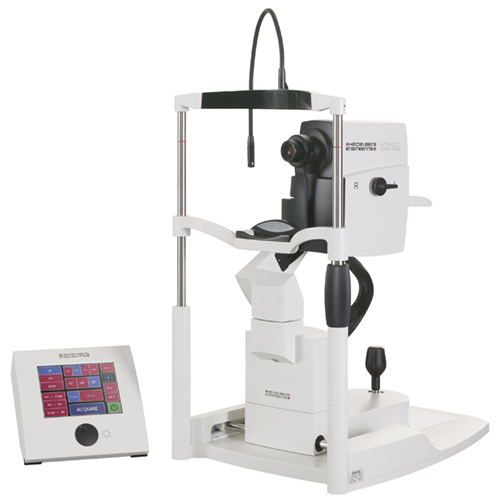 A SPECTRALIS® OCT examination provides information about the condition of the retinal layers. The examination can help identify early signs of disease in the retina and on the optic nerve head. At the start, you will be seated directly in front of the instrument. During the entire test, you will keep your head still with your chin resting on the chin rest and your head firmly against the instrument’s head band. The examiner will sit opposite from you on the other side of the instrument. You always look directly into the instrument, staring at a fixation point or at the point indicated by the eyecare professional. You can blink normally. The examination takes just a short time. When the examination begins, a blue dot will appear in the instrument. You will be asked to stare at the blue dot during the entire examination. The examiner will move the instrument toward your eye without touching you. At a safe distance from the eye, the examiner is able to produce a good image of your retina or optic nerve head. A safe light beam scans the most important structures. The examination is completely painless for you and is done without touching your eye. After the examination, your vision will not be impaired. If your eyecare professional has not dilated your pupil to conduct the OCT test or another examination, you can drive as usual.